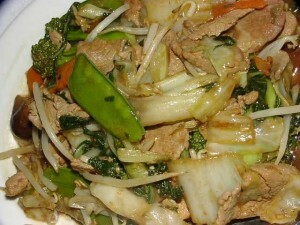 Beef Chop Suey recipe by Nazia Nazar at DesiRecipes.com. In a medium bowl mix together minced garlic , 1 tablespoon oyster sauce, 1 tablespoon soy sauce, 1 teaspoon salt , 12 teaspoon white pepper and 1 teaspoon corn flour in a bowl. Add beef and stir to mix. Keep aside to marinate for 15 minutes. Cut snow peas and celery diagonally into 1/4inchthick slices. Thickly slice the mushrooms and water chestnuts. Cut onion and bell pepper lengthwise and then cut into 1/4inchthick strips, (discard the seeds). Rinse and drain bean sprout and bamboo shoot. Heat a wok over high heat until hot but not smoking. Pour 1 teaspoon oil on the sides of the wok, add snow peas and stirfry with the seasoning of salt , until tender but still crisp, about 2 minutes. Transfer Snow peas to a large bowl and keep warm. Clean and reheat wok and stirfry the remaining vegetables separately in the same manner. Transfer vegetables to the bowl with snow peas. In a small skillet, stir together chicken stock, 1 tablespoon oyster sauce, 1 tablespoon soya sauce, 1-2 teaspoon white pepper and 1 teaspoon cornstarch. Stirring constantly, bring the mixture to a boil on medium heat and cook until the sauce is thick, about 2-3 minutes. Keep the sauce hot. Cut beef crosswise into 1/8 inch thick strips. Reheat wok over mediumhigh heat and pour 2 tablespoons oil on the sides of wok, and then stirfry beef until just cooked through, about 3 minutes. Return all vegetables to wok stir fry for one minute and then add sauce. Bring to a boil and stir to combine beef, vegetables and stock. Serve immediately, with cooked rice.